The Travel Hags will have a second July Adventure on Sunday, July 14 when they kayak the upper Pocomoke River to Porters Crossing. Hags will meet at the Pocomoke River Canoe Company in Snow Hill, then be transported up to Porters Crossing and launched. The 5.5 mile trail will wind through Cypress forests and open fields through one of the most undeveloped landscapes on the Eastern Shore. ***Hagmen are welcome but they must be brought by a Travel Hag (any wise woman with goddess attributes who’d like to attend). So guys if you want to participate, we’d love to have you but you’ve got to get a girl to bring ya’. Kayak rentals for either single or tandem (two-person) kayaks are $45. If you have your own kayak, there is a $10 launch fee. Price includes kayak, paddle, life jacket and transport to Porter’s Crossing with launch into the Pocomoke River. *** You must book your reservation with the Canoe Company now. Call (410) 632-3971 to reserve your spot on this tour. Advanced registration is required and tour is filled at 15 kayaks. Book Now. This particular trail is not difficult but it is rather long. So if you are an inexperienced paddler or apprehensive it would be a good idea to pair up with a friend and rent a tandem kayak. There’s no difference in rental price – actually it’s cheaper for two people in one boat when you split the price. 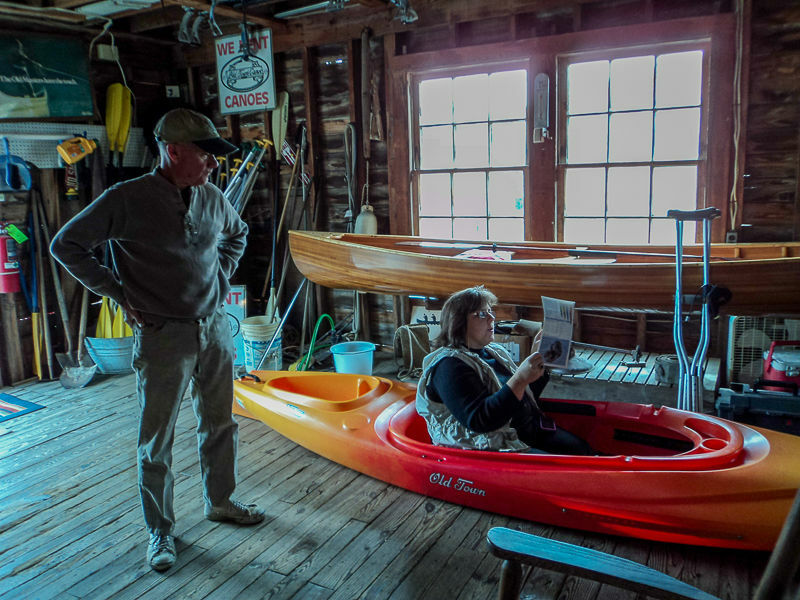 Meeting time is 10 a.m. at the Pocomoke River Canoe Company – see Google Map link here. This will put our group at the launch at high tide making for a smooth, down-river paddle. LUNCH – The paddle takes approximately three hours, but it’s easy to make a day of visiting Snow Hill. After the paddle, we’ll walk a few blocks into town and enjoy Sunday Brunch at The Palette on Green Street. (plan on $15-18). MUSEUM – After lunch we’ll walk a few more blocks and take tour of the Julia A. Purnell Museum ($2), a small museum with thousands of artifacts chronicling the culture of the Eastern Shore. GHOST WALK – For those who want to stay we’ll do a Ghost Walk of Snow Hill. The walk will be led by Mindie Burgoyne, author of Haunted Eastern Shore: Ghostly Tales from East of the Chesapeake. The tour will cover 1.5 miles if the historic downtown and residences including the Governor’s Mansion, Town Hall and one of the most haunted sites on the Eastern Shore – The Snow Hill Inn. Very haunted place! Those who attended the paddle, lunch and museum tour can do the ghost walk for FREE. Any others that want to do only the ghost walk can purchase their tickets on line ($15) – the maximum persons on the tour will be 25. Ghost tour will begin at 4:00 pm. See post about the haunted Snow Hill Inn. Send an email to tours@travelhag.com letting us know to expect you. This is crucial for the Ghost Walk as space is limited. Bring money for lunch ($18 approx) and $2 for the museum entrance fee. Come prepared to make new friends and have an unforgettable experience.